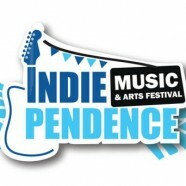 For a long time now the August Bank Holiday weekend and the Indiependence festival have been the highlight of my year. So much so that my honeymoon was scheduled around it two years back. Even back in the time when it consisted of a few acts playing on the back of a lorry in the Square it was always marked off on my calendar. First act of this year’s festivities was Axis Of at the Big Top. The Co Antrim based 3 piece have a bass laden metal sound and I wish I had gotten to see more of them than just 3 songs. Turbowolf from Bristol in the UK were the first act I got to see on the Main Stage and they didn’t disappoint. The singer/synth player had a look of Frank Zappa about him and was every bit as captivating as Zappa was. Refusing to be pigeonholed, Turbowolf switch between genres effortlessly. 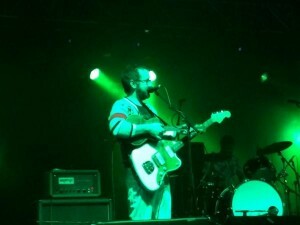 ‘Let’s Die’ is a perfect example of their versatility and the highlight of their excellent set. In a late addition to the line up Jack Savoretti replaced Gavin James. Sadly though Savoretti struggles to pull a big crowd at the Big Top. On paper, this should have been a good addition to the bill but his solo show fails to hold interest and the crowd dwindles; ‘Tie Me Down’ was the highlight of his set. It is a toss up for me as to who the Friday night highlight was but anyone who has knows me won’t be surprised to read that Jape were in the running. The crowd at the Main Stage was the largest I’ve seen Jape play to in a while and boy did they revel in it. 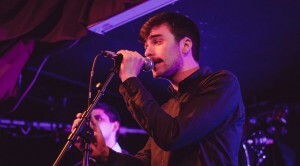 From the opener ‘The Oldest Mind’ to the closing track and fan favourite ‘Floating ‘ Jape were in tip-top form. R.S.A.G (Rarely Seen Above Ground) was my unexpected highlight as the idea of one man on a drum kit wouldn’t usually be a good one in my mind. RSAG certainly blew that idea right out of the water. His performance is mesmerising and watching the speed of the drumsticks is spellbinding. The cloud of steam rising from above the kit gives only scant indication of just how much energy is exerted during this enthralling set. 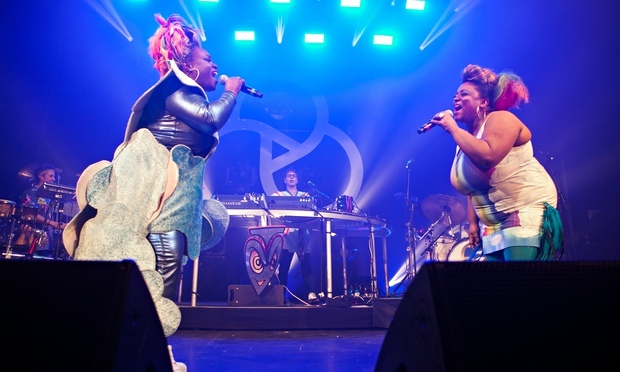 Basement Jaxx brought as expected massive energy and colour to festivities equipped with multiple vocalists, drummers and backing dancers. Songs like ‘Jump N Shout’, and ‘Romeo’ have the crowd at the packed Main Stage on their toes and dancing in the quickly worsening mud. Meanwhile over at the Big Top Mark Lanegan’s gig I found to be a bit of a let-down. Throughout his late night set, the gravel voiced American stood motionless and seemed disinterested. The highlight from what I saw of the set was as you would expect, last year’s exceptional single ‘Harvest Home’. Thankfully the weather picked up a little on Saturday morning to make for a dry start to proceedings and early afternoon atmosphere was electric. Otherkin, a 4 piece grunge pop band from Dublin, got things underway musically at the Main Stage and they set a good standard for the day too. A thumping rendition of single ‘Ay Ay’ was the highlight of their early afternoon offerings. Crow Black Chicken kept momentum up at the Big Top shortly afterwards. 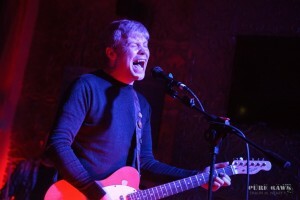 Their blues guitar based rock had the big crowd in attendance howling for more. ‘Hang ‘Em High’ was the pick of their bunch to my mind. Next up were Amazing Apples. This band of Galwegian Trad infused rockers were not to my own taste but I was in the minority here as they had a massive crowd at the Main Stage for that time in the afternoon. Brothers Richie and Jamie Martin AKA folk band Cry Monster Cry took to the Big Top stage at a difficult time of the day when people usually choose to eat. This is a time when bands often suffer to maintain the diner’s attention but throughout their set the crowds continued to grow. Current single ‘Postcards’ and a brilliant sing along version of the The Beach Boys ‘Wouldn’t It Be Nice’ ensured the crowd made the right decision. Highly fancied Little Hours sadly failed to live up to reputation during their Big Top gig. The Donegal duo’s single ‘Its Still Love’ was very rightly in the running for 2014’s Irish song of the year. Unfortunately their live show lacked something and was a little boring in parts. Indie pop duo All Tvvins played an early timeslot at the main stage. Their sound was far more energetic than their live show but it’s a great sound and I think their stage presence will increase in time. Local lads Mindriot brought the one of the largest crowds the Beer Halle Stage has seen when they played their second show of the weekend, surely helped by their former Today FM home-grown hero song ‘Low’. Before Headliners Embrace took to the main stage you would have been forgiven for having forgotten about them as they hadn’t been in the limelight for quite a while. Afterwards you may have wished they stayed out of it. Bad sound dogged their performance throughout and the anthems which once made them formidable seem to be lifeless and laboured. lot of the packed tent may have expected to see the Kells natives in this slot in the first place as over the years, they have packed out whichever tent/stage they have appeared on. Festival favourites ‘Models’ ,’Ants’ and ‘I Feel Love’ combined with confetti cannons and beach balls being launched into the crowd make for what in my mind was the highlight of the festival.Unfortunately the rain came down hard as expected on Sunday afternoon and the buzz that surrounded the place on Saturday afternoon was slightly dampened. This may also be put down to overindulgence taking its toll on the sell out 8,000 crowd. First up on in the afternoon were Dublin band The North Sea at the Big Top.This highly rated five piece have a sound which is reminiscent of the early 80’s alternative rock bands who have inspired them. Songs like ‘Drinking alone’, ‘In Love’ and ‘Decay’ make for a performance that was one of the highlights of the weekend. The only pity was there wasn’t as big a crowd as they deserved. I certainly feel that will change in the future. One band whose stage presence is growing every time I see them is The Academic. They took to Main Stage in front of an impressive crowd in the early evening with all the swagger of a band who had been headlining main stages for years. ‘Don’t be afraid to love ‘ was a big highlight for me but the fan favourite was as usual their debut single ‘Different’. I am looking forward to seeing these lads in a much more sought after timeslot next summer. English singer songwriter Eaves also came well recommended but sadly failed to draw a substantial crowd. His solo show fails to capture the attention of the few in attendance despite his excellent voice and well crafted songs. The Flaws are a band I’ve waited a long time to see. 2007’s debut ‘Achieving Vagueness’ was a great record and the live show today certainly lived up to my expectation. The Monaghan indie rockers were in fine form today and both ‘Sixteen’ and ‘Out Tonight’ were set highlights. They did however give out to me for being on my phone but I’m way too nice to mention that! Producer/DJ/Multi-instrumentalist Daithi takes advantage of the worsening conditions and performs to a full Beer Halle which at this stage had makeshift clothes lines strung up wherever possible. His big hit ‘Chameleon life’ has the crowd forgetting about the rain and dancing while their clothes dried out. The Dandy Warhols have been out of the public eye in recent years but were not long reminding people what makes them headline material. ‘Get off’, ‘Not If You Were The Last Junkie On Earth’ and crowd favourite ‘Bohemian Like You’ all helped to fill the older crowd with a sense of nostalgia but none the less made for a great headline show. Kodaline as expected had the main stage tent bulging at the seams. Opening with ‘I’m Ready’ and ‘Love Like This’ security struggle with the sudden swarm of people trying to gain entry. By the time they finished up the Sing along to ‘All I Want’ could be heard over the music in the dance tent. A far cry from their first appearance here four years ago where they played to a mere 18 people and a massive indication of just how far they have come. Sound issues at The Garden meant crowd numbers for the weekend were down on previous years but once they were sorted crowds began to gather. Sunday night highlights in The Garden were DJ’s Kelly Anne Byrne and Stevie G who had the now weary campers dancing into the wee small hours to the sounds of Disco, House and Soul Classics. The rain never seems to bother people on the Sunday night of this great festival, which continues to go from strength to strength annually.